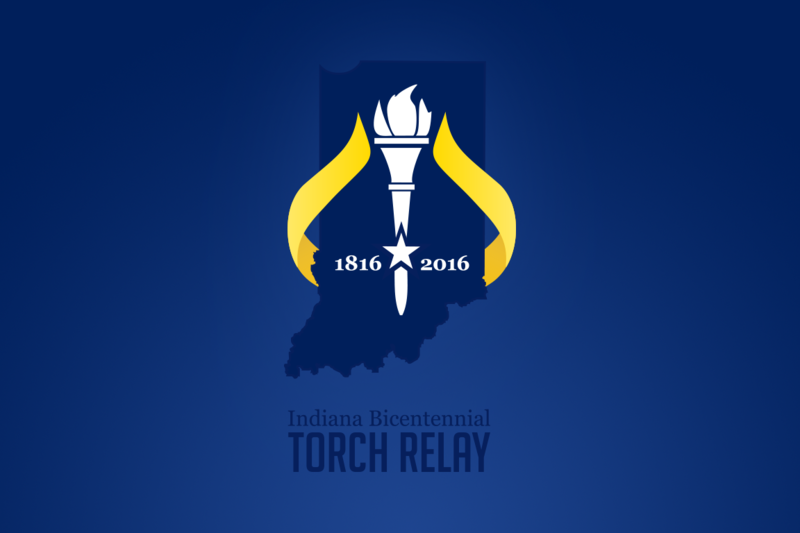 The Indiana Bicentennial Torch Relay is one of the many ways that the State of Indiana is celebrating 200 years of being a state. It is also the only celebration that incorporates all areas of the state, and allows each of them to celebrate what makes them unique. Despite all this, though, the Torch Relay is a rather quiet celebration. It is not a parade, crowds do not camp out the night before to have a good spot to watch it, and traffic is only shut down temporarily. But it is a celebration all the same, and one that is important to many people. The Relay starts early in the morning each day. On September 27, it began its three-county trek at 9 a.m. at the Delaware County Fairgrounds, following a free pancake breakfast in one of the halls. There is a birthday card for the state in each county that people can sign. Some sign their names, and others send messages, but signatures fill each card. A stage is set up, complete with a podium, microphone and stand. In front of the podium, the cauldron is assembled. It will hold the fire that was put in a lantern the night before, once the Torch was put to bed for the night. The cauldron is silver. It is a big bowl with three canisters of fuel ready and waiting for the flame. Under the bowl is a square silver stand with four poles holding the cauldron up. Between each of the poles are two silver plates, the top of which shows the state of Indiana, and the bottom of which has stars cut out of it. The lantern is much smaller, and easier to miss if you do not know what you are looking for. It is all black, with clear glass to showcase the flame. A star decorates each of the four sides above the flame, and the state of Indiana adorns the front of it. The cauldron is lit before the opening ceremony, with plenty of time for those present to take pictures in front of it. People gather around it to take a look and get photos. They begin to disperse and a hush falls on the crowd as the ceremony nears. At 9 a.m., Delaware County’s county coordinator, Nancy Carlson, steps up to the podium to begin the ceremony. The Torch has a schedule to follow, and punctuality is key. The ceremony is short. There is a presentation of colors. In Delaware County, The Society of the War of 1812 in the State of Indiana, dressed in period clothing, held the flags. The National Anthem is also sung, in Delaware County, by seventh grader Destiny Roberts. Then the county coordinator gives a short speech. Afterward, Mayor Dennis Tyler read a proclamation. He then stepped down to receive a torch and light it from the cauldron. Mark Newman, the executive director of the Indiana Office of Tourism and Development, spoke about the relay and the state’s birthday, while Tyler lit the torch. And just like that, the Relay restarts for the day, and each county’s torchbearers prepare to receive the torch. They go to their dedicated spots along the route to wait for the torch to be brought to them. At each spot, a volunteer for the county also waits. Though they will not run with the torch, the volunteers have an important duty in the relay. They are primarily responsible for the small crowds that gather to watch the torch get handed off to the next person. They make sure the crowd is safely on the sidewalk as the torch and its caravan go through each spot, said Becky Burkhart, a Delaware County volunteer for the relay. Volunteers also rally the crowd, and make sure that those present are excited as the torch approaches them. Dawn Brand-Fluhler, whose Delaware County position was the sixth in the route, brought tambourines and a radio for this purpose. She was also expecting cheerleaders and people from her daughter’s sorority to help raise some noise as the torch was passed to Stan Sollars, a professor of telecommunications at Ball State. Each torchbearer follows their route and hands the torch off to the next person. At the hand-off points, the torches are checked quickly to ensure they have enough fuel for the next leg of the trip. If they do not, the flame is passed to a new, and fully fueled, torch. Each handoff is quick. There is a schedule, after all. There is a quick photo of the hand-off and the next person is off on their leg. In Delaware County’s leg of the Relay, torchbearers included Dr. Jeff Bird, the CMO/COO of IU Ball Memorial Hospital. Bird jogged the 0.6 miles from McKinley and Riverside to University and Dicks Streets in Muncie. The torchbearers also included Barbara Ellis, who received the torch from Dr. Bird. She is an oncology nurse at IU Ball Memorial, and has been for 24 years, she said. Ellis is running the torch for her leg of the journey. “Not a runner,” Ellis said she began running after the death of her mother. Running and being in nature, Ellis said, helped her through the grief, so she was honored to have a part in the relay. These are only a few of the stories represented by the Torch Relay’s torchbearers, but as each person holds the torch, they are adding their story to the history books of Indiana. After the torch has made its way through each county, the flame is put back in the lantern for the night through a small closing ceremony in the last county on the day’s route, to wait for the chance to reignite tomorrow’s torches.On September 27, the torch began in Delaware County and ended in Jay County. It moved north to Blackford County to continue its journey the next day.